To Cite: Moshfeghi M, Beigom Taheri J, Bahemmat N, Ebrahim Evazzadeh M, Hadian H. Relationship Between Carotid Artery Calcification Detected in Dental Panoramic Images and Hypertension and Myocardial Infarction, Iran J Radiol. 2014 ; 11(3):e8714. doi: 10.5812/iranjradiol.8714. Background: Carotid artery calcification may be related to cerebrovascular accident, which may result in death or physical and mental disabilities in survivors. Objectives: Our purpose is to study the association of carotid artery calcification (CAC) on dental panoramic radiographs and two risk factors of cerebrovascular accident (CVA) including hypertension and myocardial infarction (MI). Patients and Methods: Panoramic images of 200 patients that were all women above 50 years of age (a population suffering from vascular diseases) were investigated. All panoramic images were provided under similar conditions in terms of the type of panoramic radiograph equipment, type of applied films and the automatic film processor. Then, the patients answered questions about MI history and taking antihypertensive drugs. We also measured the blood pressure of patients in two separate surveys. Data analysis was performed by SPSS statistical program. We used Exact Fisher test and Chi-Square test at a significant level of less than 0.05 to study the effect of these variables on the occurrence of carotid artery calcification. Results: Among 200 studied samples, 22 of the patients (11%) had carotid artery calcification on the dental panoramic radiograph. In total, 52 patients (26%) had hypertension and four people (2%) had a history of MI. Eleven individuals among patients suffering from hypertension (21.2%) and three individuals among patients with a history of MI (75%) demonstrated CAC on dental panoramic images . Conclusions: The relationship between CAC found on dental panoramic radiographs and two CVA risk factors--hypertension and MI-- was significant. Therefore, it seems that detection of CAC on panoramic images of dental patients must be considered by dentists. Atherosclerosis is a serious chronic inflammatory disease of a multifactorial nature, characterized by thickening and loss of elasticity of the arterial walls associated with the presence of atheromas(1-7). Atheromas are calcified plaques especially composed of lipids and fibrous tissue, which are deposited on the walls of blood vessels (3). When atherosclerosis affects the arteries that supply the brain, i.e., the carotids, strokes can happen (3, 6, 8-10). cerebrovascular accident (CVA) is the third factor of death in most countries and high costs are annually spent for mental and physical rehabilitation of patients who survive after CVA. According to statistics about 60% of patients who survive, will suffer from mental and physical disability (7, 11-18). Therefore, finding symptoms and risk factors that predict CVA is important for prevention. Some of these risk factors include hypertension, myocardial infarction (MI), high cholesterol smoking and diabetes (3, 4, 6, 8). The reduced estrogen level and other aging processes associated with menopause in women above 50 years of age are factors that increase the risk of stroke (3, 13). Two major reasons of stroke are ischemia and hemorrhage. Eighty percent of strokes are ischemic and atherosclerotic disease in the region of carotid artery can cause it (6, 8, 11, 12). Therefore, if we can trace these lesions, the possibility of preventing strokes will increase considerably. If atherosclerotic plaques are completely or incompletely calcified in the bifurcation of carotid artery, it will be possible to trace them on radiographs. 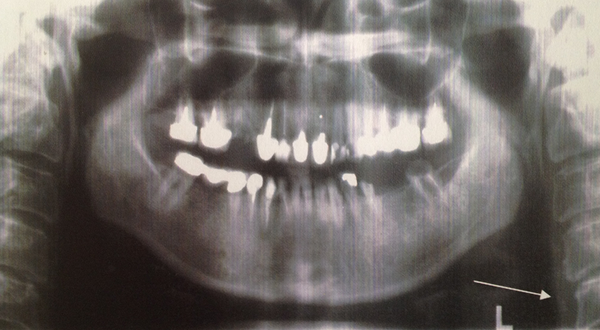 It can be detected on dental panoramic, lateral cephalometry and postero-anterior skull view (13, 14). Friedlander and Lande described the possibility of diagnosing calcified atheromatous plaque in the carotid artery on dental panoramic images for the first time (19). Panoramic radiographs are used routinely in the evaluation of patients with dental problems (10). They also have a diagnostic function in identifying atheromatous lesions. Carter et al. suggested panoramic radiographs for detecting carotid artery calcifications (CAC) to prevent CVA (16). Friedlander et al. described radiopaque nodular lesion (or lesions) as CAC, which is separate from the hyoid bone and is adjacent to the cervical vertebrae in the space between C3 and C4 or below it (20). To detect this calcification, we should consider other anatomic and pathologic radiopacities in this area as the differential diagnosis. Some of these include the hyoid bone, styloid process, epiglottis, soft palate, tongue, ear lobe, anterior tubercle of the atlas vertebra, stylohyoid and stylomandibular ligaments, thyroid cartilage, triticeal cartilages, and even calcified acnes (10). Most of these are readily distinguishable on the basis of location and morphologic features (15). In the differential diagnosis, emphasis must be laid on the triticeal cartilages. The best way to differentiate atheroma from triticeal cartilage is by considering the fact that atheromas have a more lateral anatomic localization (10). In this study, we are going to study the association of CAC on dental panoramic radiographs and two risk factors of CVA including hypertension and MI. In this study, 200 dental panoramic radiographs were investigated. It should be mentioned that all of these patients needed panoramic radiographs for dental treatment procedures and none of these panoramic images were taken for the purpose of CAC detection. Therefore, the indication for panoramic request was dental necessity. The patients consented to participate in the study. We provided these radiographs under similar conditions and used conventional panoramic equipment (Planmeca Proline PM 2002 CC, Helsinki, Finland) , 6-8 mA current, 18 seconds, 64-66 kvp voltage (based on the size of patient’s jaw), Agfa Gavaert NV ORTHO CP-G PLUS (15х30cm) extraoral film (green sensitive universal film) and “KODAK LANEX Regular” intensifying screens. Films were developed and fixed in an automatic film processor (Gendex, Clarimat 300, London, UK). Studied samples were women above 50 years old with a high incidence of atherosclerosis. . We evaluated radiographs that had a acceptable diagnostic quality (not overexposed and not underexposed) and cervical vertebrae C3-C5 were observable in them. We diagnosed CAC as nodular radiopacity at or below the intervertebral space between C3 and C4. For the differential diagnosis of CACs, other cervical calcifications, as we explained before, were excluded according to Carter’s study (16). The diagnosis of CACs on dental panoramic radiographs was performed by an oral radiologist. The patients were assessed in terms of hypertension and MI. A hypertensive patient was defined as a patient who takes antihypertensive medication or a patient with a systolic blood pressure higher than 140 mmHg and/or a diastolic blood pressure higher than 90 mmHg in two separate evaluations. We asked patients about the history of MI. Among 200 studied patients, 52 cases (26%) suffered from hypertension, four (2%) had a history of MI and 22 patients (11%) demonstrated CAC on panoramic radiographs (Figure1 and Figure 2). Among 52 patients who suffered from hypertension, 11 patients (21.2%) showed CAC on dental panoramic radiographs, while among 148 patients who did not have hypertension, only 11 patients (7.4%) demonstrated CAC on dental panoramic radiographs (P < 0.001). In other words, the relationship between hypertension and CAC in these samples was significant. Three patients with a history of MI demonstrated CAC on panoramic images (75%), while among people without such a history (196 patients), only 19 (9.7%) had CACs. We observed that the relationship between MI and the occurrence of carotid artery calcification was significant (P = 0.004). Figure 1. CAC is seen on the right side as nodular radiopacity at the intervertebral space between C3 and C4 (white arrow). Figure 2. CAC is seen under the C3-C4 intervertebral space on the left side as a nodular radiopacity (white arrow). The prevalence of CAC on panoramic radiographs is detected in different studies and the prevalence has been reported as %5, %6.2, %9.4, %13, and % 38.8 (1-5). A considerable rate of mortalities in the United States refers to strokes that occur in women after the age of 50 (14). Atheromas often have been detected on the panoramic radiographs of neurologically asymptomatic male veterans; however, similar studies have not been conducted among female veterans (14). Hoke et al. reported that there is no statistically significant association between the presence of CAC on panoramic radiographs and the presence of a significant carotid stenosis or the degree of carotid stenosis (4). In a study conducted by Masood et al., hypertension did not show a statistically significant association with CAC (6). A study carried out by Uthman et al. mentioned that people suffering stroke, had a greater prevalence of CAC on panoramic radiographs (8). Cohen et al. demonstrated that 86% of the patients who had CAC on dental panoramic images had at least one vascular risk factor (13). Friedlander introduced hypertension as the most important risk factor for atherosclerosis in menopausal women, and a significant relationship has been reported between hypertension and the occurrence of carotid artery calcification (15). But Ohba from Japan in a study on 80-year-old Japanese patients found no relation between systolic or diastolic hypertension and the existence or non-existence of CAC (11). In our study, this association was completely significant. Also, we obtained such a strong association between MI history and CAC on panoramic images. Cohen et al. in a study on 73 patients with CAC in panoramic radiography observed that 11% had a history of MI, 7% had a history of CVA, and 15% died because of vascular accidents. So they concluded that the existence of carotid artery calcification on dental panoramic radiographs could be a strong marker to predict CVA (13). Thus, the existence of CAC on panoramic radiographs along with CVA risk factors such as hypertension and a previous MI can be considered as important symptoms for predicting stroke. It should be mentioned that in our studied patients, only four patients had a history of MI, but it was interesting that most of them showed CAC on the panoramic radiographs. So nevertheless, we found association between MI and CAC on panoramic images, but it is not enough and further studies with more patients reporting a history of MI is recommended. The difference in results among the mentioned studies and also our study can be related to the differences in age, gender and ethnicity of the sample groups. Since panoramic radiographs are routinely indicated for dental patients, dentists can evaluate panoramic images to find carotid artery calcification and refer these patients to specialists to prevent all morbidity and mortalities due to strokes and other adverse vascular events that could force high costs for the healthcare system. Therefore, training general dentists in order to diagnose this calcification on panoramic radiographs is important. Besides dental problems, dentists should generally consider the existing CAC as well. The identification of CAC on dental panoramic radiographs must be performed by an experienced evaluator. So training, experience and the specialty of the dentistare also important. Almog demonstrated that the probability of wrong diagnosis was high when the dentists didnot have enough experience and specialty to detect CAC on panoramic radiographs (17). Wrong diagnosis can result in enforcing unnecessary considerable costs (for example angiography) to the patient and the society. An atherosclerotic lesion is not always calcified, Almog et al. demonstrated that 50% of the patients who had CAC on their panoramic radiographs had a higher than 50% carotid artery stenosis. When panoramic radiographs do not show calcification, the percentage of vessel stenosis will be only 21 % (14). Panoramic radiographs are not as useful as Doppler ultrasonography and CT in detecting atherosclerotic plaques in the carotid arteries and especially stenosis of the vessels, but it is a very cheap and non-invasive method in comparison to other imaging methods and they are commonly used in dental patients. 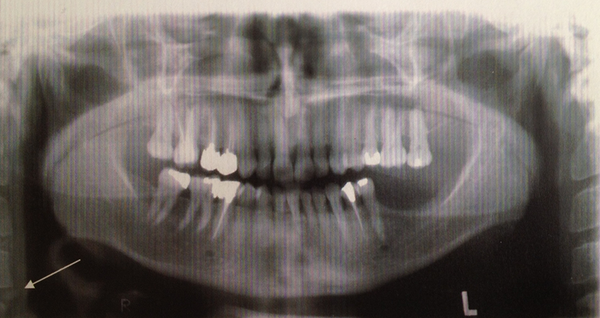 Panoramic radiographs may help us to detect CACs in patients with or without other associated risk factors (10). There were imitations to our study. First, identification of MI based on history is not as certain as ECG findings, but it was not possible in our study to detect MI with other methods such as ECG. Second, unfortunately, the number of patients with a history of MI in our study was small; therefore, more investigations in greater sample sizes are necessary. Third, some cases of carotid plaques are not calcified so they cannot be detected on radiographs. However, the diagnosis of calcified ones can have an important role in preventing CVA. In our study, the prevalence of CAC was 11% and it shows the importance of panoramic radiograph evaluation in detecting CAC. There is a significant relationship between the presence of CAC on panoramic radiographs and the two other CVA risk factors including hypertension and MI history, so a detailed evaluation of panoramic radiographs is very important. Taking panoramic radiographs just to detect CAC is not recommended, but patients should be referred for further evaluation when CAC is detected on dental panoramic radiographs. Dental panoramic radiographs should be carefully examined in the area of the carotid artery in not only patients with systemic disease, but also asymptomatic patients.